and delight all your neighbors and friends with your own creations. • Any bubble juice provided and not used, will remain the property of Café du Cirque. Kindly ensure that your guests and children do not leave the premises with any bubble wands or equipment. • The bubble juice is a soapy liquid, so expect some good, clean fun. Fancy dress is not recommended for our Bubble Magic parties. • As we use the property of Café du Cirque for the Bubble Magic birthday parties, no food or drink other than the birthday cake (1) will be allowed to be brought onto the property. We charge a R50 own cake fee per cake. • Please be aware that bad weather will affect our bubbles. 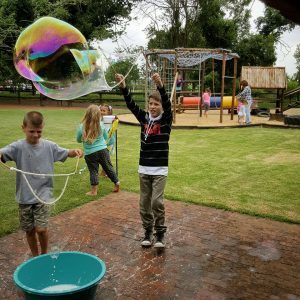 We will do everything we can to make your party a magical one, but we cannot be held responsible for weather conditions and the effect it will have on the bubbles. A 50% non-refundable deposit will be required within 3 days of making the booking. Deposit slip to be e-mailed. Cash deposits or internet transfers will only be accepted. Cheque deposits no longer accepted. No exceptions! Balance of payment can be made 3 days before the party. Contact us for more information on our party options. 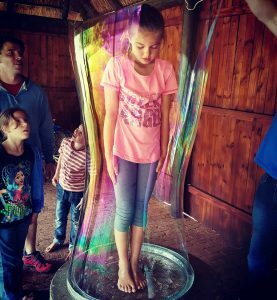 Book and pay your deposit and you will receive your very own “Bubble magic” solution and giant wand set to take home with you (1 per booking only).